We created a universal customer loyalty card that embraces the power of network effects, social media integration & improves the customer experience. 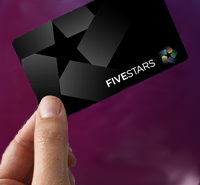 What this means for cardholders: we help you replace all those punch cards from your wallet with the one FiveStars card! We connect a card to your phone number when you sign up at one of our participating locations so that you can never miss out on earning points again! Check your point balances by registering your card. Want bonus points? Connect your card to Facebook and opt-in to our sharing features. You’ll earn bonus points for your checkins and unlock cool milestone messages along the way! What this means for business owners: Finally have a loyalty program that all of your customers will use! The signup process is simple and can be done right from your POS. We do all the heavy lifting for you: we collect the data, provide clear analytics, and give you great ways to stay in touch with your customer base. Not to mention we’re the only loyalty program that comes with hundreds of thousands of users that are ready to discover and use their card at your store! Let us help make your business easier, smarter, and more profitable. Brand loyalty. Now I get it ! I am an old gray haired Grandma who got one of your cards while visiting a shop in Sunnyvale. Silly me — I signed up with my son’s phone number and thought I’d give the card to him since he lives in the area. I live in the Fremont area. I wish my local fro-yo places here were members– and a couple of more places I go to as well ! Can I become a sales rep for you 😉 ? Or perhaps you’d hire me to do all that tedious copying you mention on your blog? I need a new career! You have a great idea! I hope Fivestars becomes a big success! There is! Most of our quick serve locations have key chain cards, and you can ask for a new key chain FiveStars card. They can scan it like a “new customer” registration. Giving them your phone number (the one you already use) will tie the key chain card to your account. I read your post about mobile apps, but hope you will investigate and consider releasing a card for the iOS6 Passbook app. Currently, I’m using the five stars card only about 2 in 5 visits because either the vendor doesn’t mention it or I forget to point it out. Passbook is going to be popular, particular with Apple driving adoption and as a built in app, you’ll find many iPhone users ready to participate. Thanks for your thoughts, Paul! We will definitely launch mobile integration soon. In the startup world, timing and proper execution is everything. Also, we want to build it a bit differently, using technology that will make an app even easier to use! We’ll be sure to keep you posted. In the meantime, we’re working on training initiatives aimed at getting more employees to prompt customers to use their card (or phone number). Even though you might only remember to use your card every 2 out of 5 visits, that’s still way more frequently than the average numbers we’re seeing with mobile loyalty apps. Hope this was at least a little helpful and thanks again for sharing! You can pick up a card at any of our participating locations. I love the integration you have with thePOS to capture the customers transaction information and giving the merchant the opportunity to know who their customers are. I have an intriguing question for you, why not plug a device on the merchant to capture a more interactive activity just like Belly or Spot On? Are you going to stablish a presence in NYC? 1.) The more devices you have the more confusing a program becomes — If you throw a curve ball to your customers, they don’t use the program. Our goal is to keep it as simple as tapping a card with more features than ipads can support. I think that’s pretty cool — more for less? Done! 2.) Cost — External devices cost money. Any added costs we have as a program we need to compensate–ie charging the merchants more money. Our goal in starting fivestars was to provide merchants a fortune 500 system at a reasonable price and one of the ways we do this is through limiting our costs. 3.) Integration and Customer Service — by having a cashier facing program we can help our merchants provide a higher level of service to their customers (ie identifying them by name, knowing if they are a vip, etc.) Also by running on the point of sale system we can potentially run a more in-depth integration than either Belly or Spot-On can with only a stand alone device. I hope this answers your question. Let me know if you have any other thoughts or comments and I’d be happy to answer them.